Set amidst the 1999 student strikes in Mexico City, this coming-of-age tale follows two brothers venturing through the city in a sentimental search for an ageing legendary musician. Tomás is too much for his lone mother so she sends him to live with his older brother Federico, (aka Sombra) and his roommate Santos, in Mexico City. Both are students at the university, but they spend most of their time hanging out at home having boycotted school for the past few months as part of an ongoing student strike. Boredom leads the trio to embark on an unusual mission when they find out that their late father’s musical hero, Epigmenio Cruz is dying. Travelling through the city in their rusty car soon becomes a voyage of self-discovery in this road movie in which the travellers barely manage to leave town. 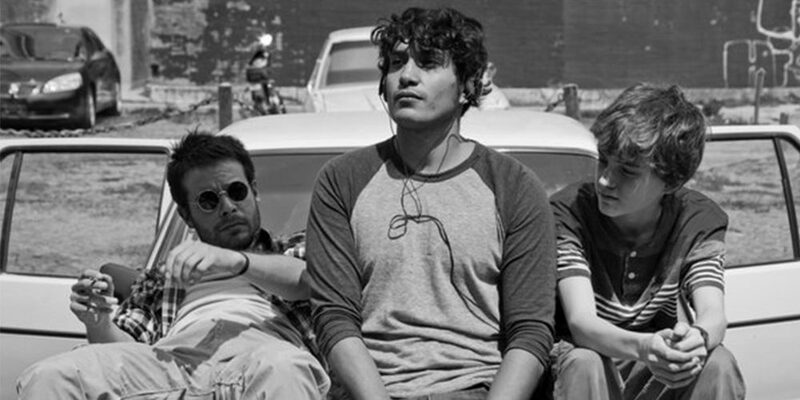 With witty dialogue and crisp black and white cinematography, Güeros is a must for fans of New Wave cinema and anyone looking to experience new Mexican film-making at its best. Winner of 21 awards including Best First Feature, Berlin International Film Festival 2014 Winner Best Cinematography Tribeca Film Festival 2014 Winner of 5 Mexican Ariel “Academy Awards”, including Best Film and Best Director.